The cache is located near Manitoba Hydro's Dorsey Converter Station, which is the southern terminus for the utility's high voltage direct current (HVDC) transmission lines. Built in 1968, Dorsey is located near the town of Rosser, Manitoba, about 26 kilometres northwest of the City of Winnipeg. The converter station was named after Professor John Dorsey, who taught electrical engineering at the University of Manitoba from 1912 to 1952. Professor Dorsey was well known for his work on the transmission of electricity. DC is used for long distance transmission because it offers certain advantages over AC. For example, the losses of electricity are considerably lower with DC, and the cost of building a DC transmission line system is more economical than an AC system. Over 70 per cent of the electricity produced in Manitoba is transmitted through Manitoba Hydro's Dorsey Converter Station. Most of the electricity produced at Manitoba Hydro's three largest generating stations built on the Nelson River in northern Manitoba is converted from alternating current (AC) to direct current (DC) at the Radisson and Henday converter stations, which are located close to the stations. The electrical current is transmitted south to the Dorsey Converter Station by way of two bipolar high voltage direct current transmission lines. From Gillam to Dorsey they follow a route that takes them through Manitoba's Interlake region. The term bipole refers to the two conductors or "poles" on each tower line. The DC electricity is converted back to AC at Dorsey for distribution via Manitoba Hydro's 230 kV transmission line system. From there the AC feeds the balance of Manitoba's southern electrical system and the interconnecting electrical systems to Saskatchewan, Ontario and the U.S.A.
On the west side of the gravel road, as you approach the cache, you will notice the Bipole 2 electrode carried on wooden poles. This travels, along with the Bipole 1 electrode to the east, to a really big ground at N50° 10.469 W97° 24.133. This allows the HVDC bipole to run as a monopole and use the earth for the return path (there’s another huge ground rod at Radisson). You can spot the HVDC bipoles to the east of the cache, they are carried on tall one legged steel towers. 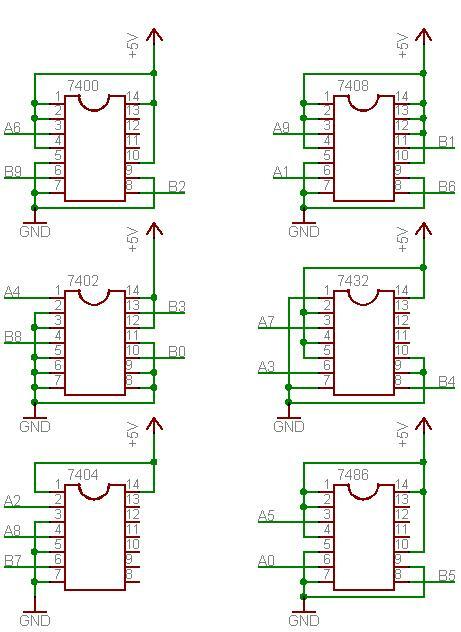 To find the cache you need to solve for the outputs A0-A9 and B0-B9 which form unsigned numbers. With A0 being the least significant and A9 the most significant digit. The checksum (sum of the digits) for A is 0x6 and B is 0x7.